Us Aussies are an intrepid bunch. We travel to the far, faaar corners of the earth in search of beauty and adventure. But! What if we were to tell you the most incredible nature getaway is closer than you think? Yup, we’re talking about the magical city that is Auckland. Just a teeny, tiny plane ride away, New Zealand’s largest city is the ultimate holiday destination for a short break. Boasting not only great eats, drinks and entertainment, Auckland is also brimming with all things nature. From exotic islands and wild black sand beaches, to bucket-loads of volcanoes and walking tracks for days, Auckland has it ALL. We’ve teamed up with Auckland Tourism to showcase how incredible the city is and why you need to visit this natural wonderland. Auckland isn’t usually top-of-mind when you think of island getaways—but it should be! There’s an abundance of unique islands to explore—many of which are just a short ferry ride from Auckland’s CBD. Head to the much-loved Waiheke Island where you’ll find a haven of vineyards, olive groves and picturesque beaches. If you’re feeling more adventurous, make a beeline for the volcanic Rangitoto Island and climb to the summit—the views back towards the city’s skyline are truly breathtaking. Alternatively, come face-to-face with New Zealand’s native birds (including the elusive kiwi!) on Tiritiri Matangi Island. Talk about an idyllic island escape. Fiji who? The Beaches Will Take Your Breath Away. Guaranteed. You’re never far from the sea in Auckland—in fact, you can walk across Auckland from one coast to the other in a day. Embark on a roadie north to discover the golden sands and clear waters of Tāwharanui and Pakiri. Visit city beaches such as Mission Bay and Takapuna, where you’ll be within arm’s reach of the the city’s finest beach-side cafes. However, the real magic can be found on Auckland’s West Coast. Here you’ll stumble upon remote black sand beaches with rugged coastlines and spectacular surf. 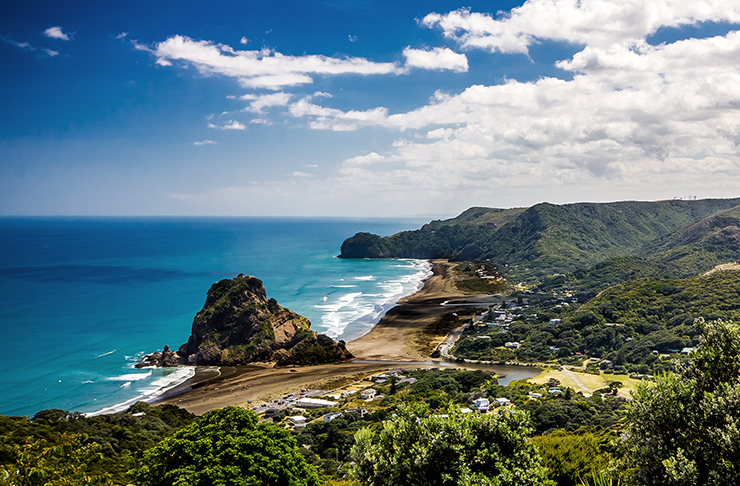 Feel your feet sizzle on the hot sands of Piha, Muriwai and Karekare. Less than an hour out of the CBD, this is New Zealand at its finest. Auckland has not one, not two, but more than 50 volcanoes. While it’d be near impossible to visit them all, there are a few faves to hit up on your short break. Located in the heart of Auckland Central, Mount Eden showcases 360-degree views of the city and beyond—you can also marvel into the volcano’s grassy crater! One Tree Hill (which is more of a volcano than a hill) forms the largest park in Auckland. Areas of the park double as a farm so don’t be surprised if you discover sheep roaming free (so New Zealand right now). And then, located on the North Shore, you’ll find Mount Victoria with its magnificent views of the city’s skyline and the gulf. Be Sure To Pack Your Walking Shoes! The best way to get amongst all that nature is to embrace Auckland’s walking (and biking!) tracks. 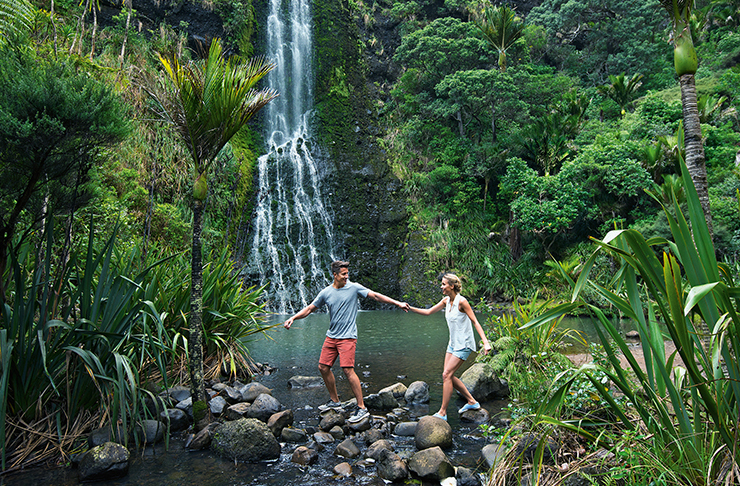 To the west you’ve got the lush Waitakere Ranges brimming with native bush, waterfalls and picturesque coastlines. Explore the south-eastern Hunua Ranges where you’ll find bubbling streams and magnificent vistas. And with regional parks throughout Auckland, you’re never short of a scenic picnic spot! If you’re an adrenaline-junkie looking for your next heart-racing fix, Auckland has you covered. Walk around the Sky Tower’s narrow outdoor platform or, if you’re extra brave, do the SkyJump and leap off the tower. The adventure doesn’t stop there—no siree! Canyon down waterfalls, zip-line above trees and take a ride in a seaplane. And, let’s be honest, no trip to New Zealand would be complete without a bungy jump. Brave the bridge bungy and leap off the iconic Harbour Bridge—eek!